Drying, as a method of food preservation, probably pre-dates civilisation. In hot climates it is so easy, just leave whatever you wish to dry on a stone in the sun. Even today, fishermen in hot countries dry their catches by simply hanging the fish on lines in the sun and wind. 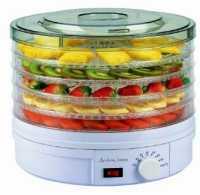 Drying works by simply dehydrating the food. 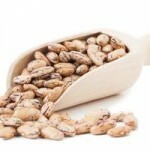 Removing the moisture from the food prevents the growth of bacteria and moulds. 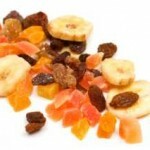 Although properly dried food is safe from microbial action, there’s still the risk of insect and even rodent damage. Storing in air-tight jars or tins will generally prevent this. Keeping your dried foods at a temperature below 21°C (70°F) will also help with insect damage as many of the tiny insects that like to dine on our foods prefer it warm. This is simple, needing no equipment, and just involves hanging the food to be dried in somewhere warm with a decent amount of airflow. 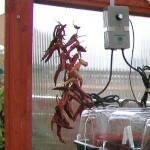 We dry our chilli peppers in this way. There’s a wide range of machines on the market with varying capacities and features. They used to be quite expensive but in recent years low cost models have appeared on the market. They are controllable, efficient and effective. You can build a simple drying cabinet for next to nothing at home if you have a little skill. Build from wood (thin plywood or whatever you have to hand) a box or even use a stout cardboard box. Completely seal it except for a few holes in the sides towards the bottom under the heat source and at the top to allow ventilation. Obviously, some sort of “door” needs to be allowed for placing whatever you are drying inside. A heat source is also needed and electricity is most convenient and safe. We found the heat from a 60 watt light bulb gave the right temperature for a box of about 2 ½ feet by 1 ½ feet (75 cm x 45 cm). 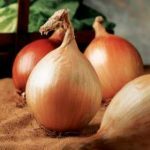 The bulb needs to go in the bottom, protected from any dripping juices by a perforated piece of wood, thin metal sheet or cardboard suspended above it. Ventilation is important so that the warm air can circulate freely throughout the whole cabinet, so the food should be placed on either perforated trays, trays or racks with wooden slats and a cheesecloth or muslin base. Wire cake trays or weldmesh cut to size with cheesecloth or muslin stretched over them and fastened at the corners with pin can also be used. The fabric allows air through but stops the imprint of the wire from marking the fruit or vegetable. Unlike the commercial bought dryers with their thermostats and timers, you need to use your judgement as to when things are ready. Effectively a box lined with reflective aluminium foil with ventilation holes at the base at the rear and through the top at the front with wire shelves and a glass front. The concept is that the sun heats the chamber, drawing in cold air at the base, passing it trough the cabinet and out through the top. Problem is lack of sun in the UK. You can use an ordinary oven to dry foods but the oven needs to be capable of working at a very low temperature, 50°C (122°F). Electric fan ovens that will work this low are great, followed by solid fuel ranges with cool ovens and finally gas. Gas ovens tend to be more humid so are not recommended. With a solid-fuel, wood or oil fired oven like an Aga or Rayburn, the heat remaining after cooking sessions can be utilized. This may mean that the drying process is not continuous and has to be carried out over several days but this should not affect the quality of the finished product. Use the simmering oven in solid fuel cookers drying and do allow for adequate ventilation. You can leave the door open to keep the temperature down and airflow up but please be careful with children and pets. 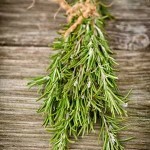 You can use a microwave for drying herbs successfully but we’ve not tried drying other foods and doubt it would work for them. 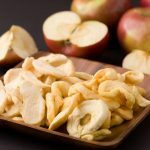 Drying Apples & Pears - How to Dry Apples & Pears shows you how to make these lovely sweet snacks with or without a dehydrator. Drying Apricots, Peaches, Plums - How to Dry Apricots etc. 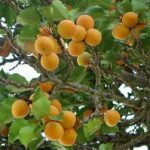 Drying apricots, peaches and plums is popular since they make such a lovely snack sweet Don't forget they're high in sugars and everything in moderation. 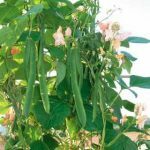 Traditionally runner beans were salted and I would suggest freezing as the storage method of choice, but drying runner beans and French beans is possible. 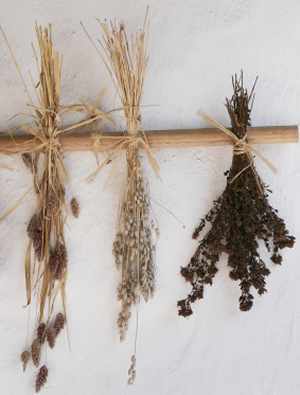 Drying herbs is really quite easy and doesn't require a drying cabinet or machine. Drying concentrates the herb flavour and they can be preferable to fresh. Vegetables can be dried but generally there are better ways to store. Some exception to this are tomatoes, haricot beans, marrowfat peas and chilli peppers. 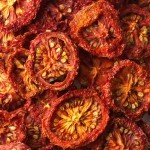 You can easily make your own sun dried tomatoes at home just using your oven. A gourmet food that can cost little more than some home grown tomatoes.